The second coming of Ryanair to Ukraine is considered by most as a welcome news, not least because of expectation of low fares this carrier is famous for. 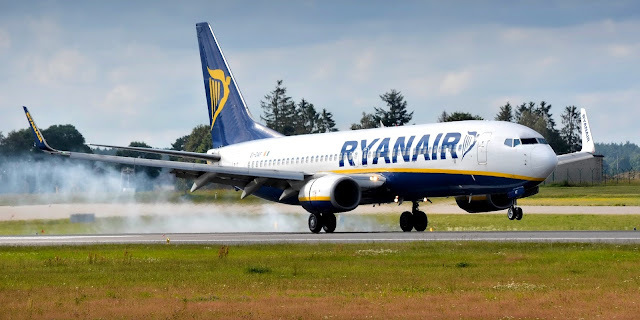 Ryanair is the largest European company in the group of airlines commonly referred to as Low-Cost Carriers (LCCs). There is no universally accepted definition of an LCC, and some of the sources of the LCCs’ cost advantages are related to their business models as compared to the so-called Full-Service Carriers. For instance, full-service carriers’ operations are considerably more complex than those of LCCs. FSCs operate networks that require more sophisticated technology to ensure that passengers and their luggage are able to connect between flights in the airline’s network, whereas most airlines classified as LCCs only perform point-to-point operations. Network complexity also necessitates using different aircraft types, which implies that FSCs will have higher maintenance costs than LCCs, other things being equal. Use of a single aircraft type will generally limit the kinds of markets an airline will be able to serve – if your fleet only includes Boeing-737 aircraft, for instance, you will likely be unable to profitably serve smaller cities. Airlines that have been operating in the pre-liberalization era tend to also have more complex and rigid labor relationships than younger carriers. This will mean higher labor cost and/or less flexibility when an FSC has to come up with ways to generate savings in this category. Established network carriers often have to deal with strong labor unions, which sometimes do not hesitate to use industrial actions to obtain a better deal with their airline. In Europe, LCCs have been able to reach about 35 percent market share. Figure 1 below shows that two out of the top-5 airlines in Europe (Ryanair and easyJet) are LCCs. Furthermore, Norwegian, Wizzair (Europe’s 6th and 9th largest airlines, respectively) have over the last decade been the fastest growing carriers in Europe. Generally speaking, Low-Cost Airlines have made air travel possible for millions of people, who would otherwise never dream about stepping on board an airplane. These carriers have been instrumental in the development of tourism (according to IATA, nearly half of all tourists worldwide travel to their destinations by air), made it possible for migrant workers to see their friends and relatives more frequently, and put some smaller communities on the map. Overall, I welcome any market developments which lead to a more competitive environment in the airline industry and create more choice for passengers. Ryanair’s entry into Ukraine is, of course, a step in this direction. But, can LCC entry have negative consequences? Potential negative effects of LCC entry can include deterioration of service quality (and generally disappearance of higher-end product options); and disruption of FSCs’ networks. Moreover, low-cost carriers do not tend to increase the airport’s connectivity as much as the network airlines do. And, last but not least, we can suspect that LCCs might contribute less than FSCs to making a respective urban area a more attractive place for multinational firms to locate their regional subsidiaries in. Let us review these points in more detail. Potential negative effects of LCC entry can include deterioration of service quality (and generally disappearance of higher-end product options); and disruption of FSCs’ networks. LCCs are associated with lower service standards as compared to FSCs. When traveling with Ryanair or Wizzair, one can expect basic levels of service, charges for checked luggage and onboard meals, snacks and drinks, lack of customer loyalty programs, etc. This proposition is more attractive to price-conscious leisure traveler than to business passengers, who tend to prioritize schedule convenience. Moreover, on average LCCs offer lower flight frequency as compared to FSCs. This further makes such services less attractive to business travelers. From my perspective, availability of both morning, afternoon, and evening flights with KLM makes it possible, for instance, to return home from a business trip in the evening instead of spending an extra night at the destination. With EasyJet or Ryanair, I would have to adjust to the airline’s schedule, while with KLM I know there will be a flight option convenient to my schedule. Additionally, KLM offers connecting flights to destinations all over the world, while with Ryanair and EasyJet I can only reach a handful of destinations to which the airlines fly non-stop. The above considerations are not a major problem unless LCCs operations disrupt the FSCs’ networks. It is one thing to have both business-friendly and leisure-friendly products co-existing on the market; but if business-friendly product disappears, we may have a problem. For instance, Malev Hungarian Airlines went bankrupt in February 2012. While we cannot point to Wizzair as the sole cause for Malev’s bankruptcy (the carrier had a number of issues with its business strategy and management); development of Wizzair at Budapest airport was definitely a contributing factor. Following this bankruptcy, flight frequency on most routes declined (despite a post-bankruptcy expansion of Wizzair and entry of Ryanair). Nevertheless, my research demonstrated that lower fares have in most cases more than adequately compensated the passengers for lower service frequency. The scale of current Wizzair’s and projected Ryanair’s presence on Ukrainian market is fairly modest to suggest that it can threaten UIA’s network. Lower fares have in most cases more than adequately compensated the passengers for lower service frequency. The scale of current Wizzair’s and projected Ryanair’s presence on Ukrainian market is fairly modest to suggest that it can threaten UIA’s network. Given that most LCCs offer point-to-point services (while Ryanair started experimenting with offering connecting flights, it is presently far from what the network airlines such as KLM or Lufthansa offer); additional LCC services do not add much to airport’s connectivity. A flight to a hub airport (such as the recently launched Qatar Airways’ service to Doha) connects Kyiv with the rest of the world (or large part of the world, at least); while a Ryanair flight to London connects Lviv only to London. Academic literature suggests that a well-connected airport makes a respective urban area an attractive place for large multinational firms to do business. For instance, Microsoft chose to locate its European HQ next to Amsterdam Schiphol airport, taking advantage of several non-stop Amsterdam-Seattle flights, and also the ability to quickly and efficiently connect via Amsterdam to pretty much any destination in Europe. Another study demonstrates that new non-stop services by low-cost carriers do not have an impact on regional exports, whereas the new FSC flights do. That is, the available evidence shows that if authorities are interested in using connectivity provided by aviation as a tool to boost business in the area; they should focus on attracting full-service network airlines rather than LCCs. Low-Cost Carriers tend to be used by leisure travelers, and attracting LCCs is a good way to develop both inbound and outbound tourism. To conclude, both full service and low-cost carriers play their roles in the development of commercial aviation. We, however, need to clearly understand that these roles are different. Network full-service carriers connect cities to the rest of the world and increase urban areas’ attractiveness to businesses. Low-cost carriers connect cities to a handful of destinations and primarily serve to increase leisure traffic. I do not suggest that one is better than the other, and new airlines’ entry should be encouraged, provided they are willing to compete fairly. We should, in the end, strive for balanced growth of aviation, making sure that a wide range of services is available to passengers. This article was first published at VoxUkraine.org. Republished at IndraStra.com under Creative Commons NoDerivatives License, provided by the Original Publisher. Dr. Volodymyr Bilotkach is a VoxUkraine Editorial Board member. He is currently working as a Senior Lecturer in Economics at Newcastle University (Since 2012). He has previously taught at the University of California, Irvine, and Northumbria University; and held short-time appointments with Kyiv School of Economics, Korea University, ZEW in Mannheim, and Hiroshima University. Dr. Bilotkach is Associate Editor of Journal of Air Transport Management and serves on Editorial Board of Research in Transportation Economics. He is also the author of the book "Economics of Airlines", published by Agenda Publishing in September 2017. VoxUkraine is an independent and unbiased analytical platform, founded and headed by a team of experienced and highly skilled economists and lawyers working in Ukraine and abroad. The purpose of VoxUkraine is to support economic reforms in the country through the promotion of research-based economic policy analysis, independent assessment of economic transformations, monitoring, and integration of Ukraine into the global network of economists and political leaders.